While supplies last! Only still a few single pieces left! The new engage Chord Flatbar is intended for racers thanks to its low weight, its sprinting stability and extreme stiffness. The clamping section features a structured surface in order to clamp the stem more securely and to prevent bar slippage. For a high stiffness the bar is suited for all OS stems with a bar clamp diameter of 31.8 mm. Ther Chord handlebar from engage is available in the popular widths of 600/620/640 mm and features a backsweep of 6°. 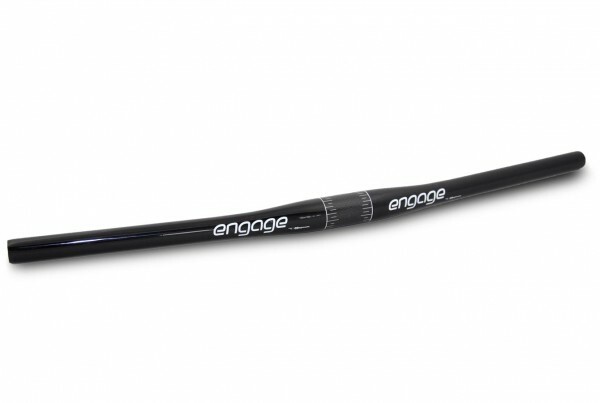 It is just as well as its sister model, the engage Chord Riser bar, also approved for the use of Bar Ends and can be ridden without bar plugs. The subtle, clear design in combination with the UD finish make it a noble tuning upgrade for every MTB. Customer evaluation for "engage Chord MTB-Flatbar Carbon-Lenker"